My mother once said that her parents raised two families of three children each, because there was a gap between children numbers 3 and 4. If that’s true, then my parents raised three families of one child each. There is a considerable gap between each of us. We each share similar, yet separate memories of Dad. My brother knew Dad as a lost man, and saw him lose his temper without remorse. My sister knew Dad during his busiest season of life, and enjoyed her place as the baby and the only girl for many years. When I entered the world, my brother had moved out before I had any realization that he had even been there. My sister and I were close when I was small, but as time has a way of doing, it turned her into a mature teenager, and only made me an awkward and annoying “tween”. I suppose I knew Dad in his most relaxed season of life. He had been saved a long time and was growing as a Christian. I was his “partner” and he was my only friend. We rode bikes together, shopped at hardware stores – or did any errand- together. In short, we were inseparable, until I said “I do”. Fortunately for me, Dad loved my husband almost as much as I did, so we agreed together to allow Terry into our “club”. It was a devastating blow when the Lord took Dad home so suddenly in 2004. He still worked hard in the heat, whistled loud, sang silly songs, and had a constant twinkle in his eye. It didn’t seem possible that he could be gone when my life was just starting, I was only 26. The worse part was that I hadn’t even gotten to say goodbye. In July, it will be 12 long years since I last heard his voice, or saw his smile. I’m sure you think I should be over it by now; that his death should just be a painful, yet fading, memory. But it isn’t. 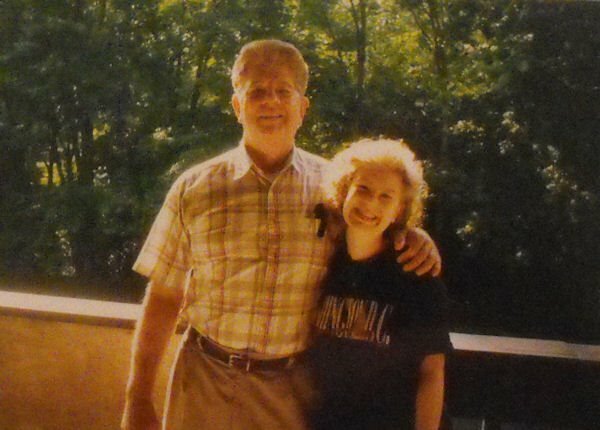 Immediately following Dad’s death, I dreamed about him most nights. I’ve never been to a psychologist or counselor (I’m sure I’d be a real study! ), but I have always assumed that the dreams were my brain’s way of dealing with the tragedy, of making sense of it, of holding on to something intangible so that I wouldn’t lose it forever. For instance, I dreamed that he told me he was okay. I dreamed that I finally got to say, “Thank you for my life.” and “I love you.”, and “I’m sorry I wasn’t there.” Some of them were so vivid, that if I weren’t firmly grounded in the Word of God, I would have been convinced that the Lord was sending Dad to talk to me. The dreams stopped about a year after his death. Until a few nights ago. Lauren has been selected to play the trumpet in a state-wide homeschooling band in April. In my dream, Dad was there in the audience, smiling and enjoying the performance. I was so thrilled he could be there, but when I tried to go talk to him, he was gone. Unlike the dreams immediately following his death, I awoke from this one feeling happy that I had “seen” him again, and that he seemed pleased. I was reminded that, while I felt frustrated at not being able to speak to him in my dream, I know I’ll catch up with him one day soon. I even felt thankful. Yes, I’m grateful that, even though his smile is absent from our lives, there are little pieces of him still with us, like the gleaming trumpet that Lauren can play just as loudly as he ever did. It has taken an awfully long time, but I finally feel that I am living with my grief, rather than grieving that I live. I am in tears while reading this. It seems like you were also very close to your father not to mention you were the ‘favourite’ child. 😉 I know it feels good to have a loved one who passed away appear in my dream, and I always wake up thinking, “wish the dream didn’t end there and hope it continues when I go to sleep tonight.” 🙂 Anyway, I can totally relate with how you feel . . . I am the youngest in the family and lost my dad before I turned 15 when all my 4 siblings were already in college and living in the big city. I still do miss him to this day. Though in some ways my mother kind’a prepare me for his passing (he was taken ill and was given a prognosis that he would only live for another 6-9 months), I’ve learned early on that nothing really prepares us for the death of a loved one. Hope the memory of your father continue to inspire you to be a good parent to your children. Have a blessed day at church tomorrow. Thank you so much for these kind words. I’m pretty sure that each of us felt like the “favorite” since we all had our own individual season with him. I’m glad to hear I’m not the only one who has dreamed of dead loved ones.